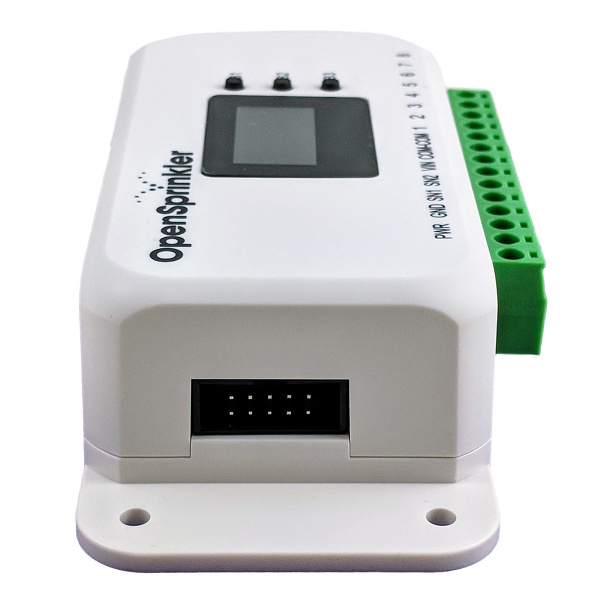 OpenSprinkler is an open-source, web-based smart sprinkler controller for lawn and plant watering, drip irrigation, farm irrigation, hydroponics etc. The current version is OS 3.0, with built-in WiFi and OLED display. You can choose between AC-powered, DC-powered, or Latch version. Take a look at this Getting Started Guide for details of version 3.0, and FAQs for common questions.. Among the new features, 3.0 supports built-in WiFi, Over-the-Air (OTA) firmware update, and 2 independent sensors. 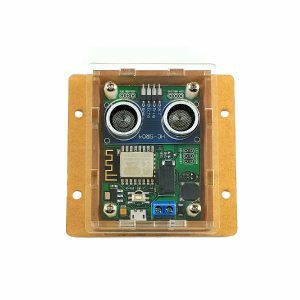 If you prefer wired Ethernet port and do not want built-in WiFi, choose version 2.3 (with acrylic enclosure, a lead time of 1 weeks may apply depending on stock). Volume discount available (starting with 5 units). See below for details. 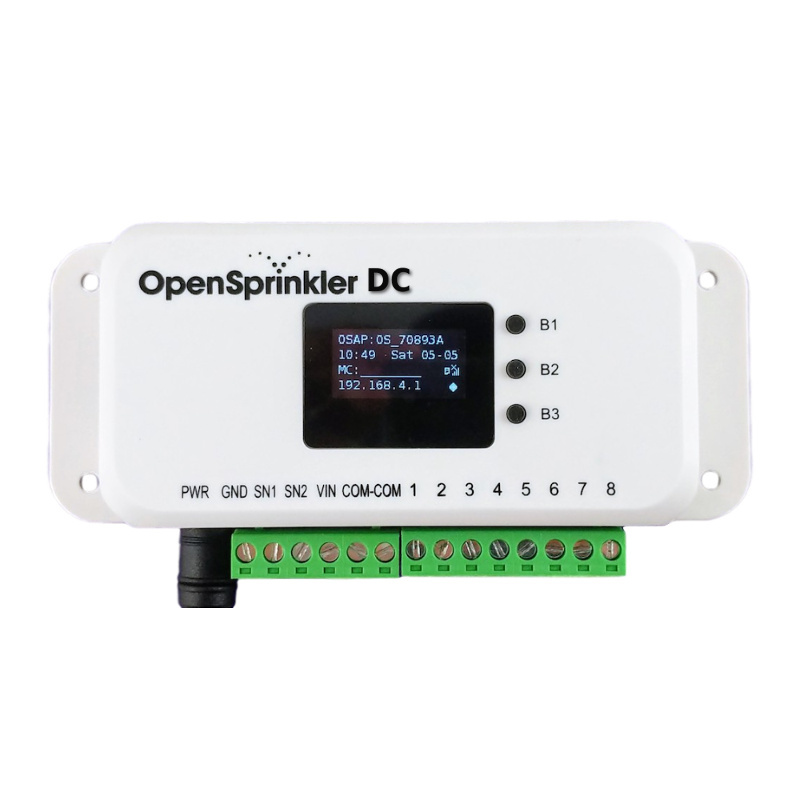 OpenSprinkler is an open-source, web-based smart sprinkler controller for lawn and plant watering, drip irrigation, farm irrigation, hydroponics etc. OpenSprinkler is accessible through any modern browser or via our free mobile app available for most mobile platforms. The current version is OS 3.0, with built-in WiFi and OLED display. You can choose between AC-powered, DC-powered, or Latch version. Take a look at this Getting Started Guide for details of version 3.0, and FAQs for common questions. Among the new features, 3.0 supports built-in WiFi, Over-the-Air (OTA) firmware update, and 2 independent sensors. If you prefer wired Ethernet port and do not want built-in WiFi, choose version 2.3 (with acrylic enclosure, a lead time of 1~2 weeks may apply depending on stock). AC-powered version requires a 24VAC sprinkler transformer (NOT included by default but can be purchased as add-on). It is designed to work with 24VAC valves only. If you have a 24VAC pump start relay, this is the recommended version. DC-powered version uses a 7.5VDC power adapter, included in the package for all orders shipped to US/Canada/Mexico (excluded for other countries). It is designed to work with both 24VAC solenoid valves as well as DC non-latching (e.g. 12VDC) solenoid valves or fish-tank pumps. 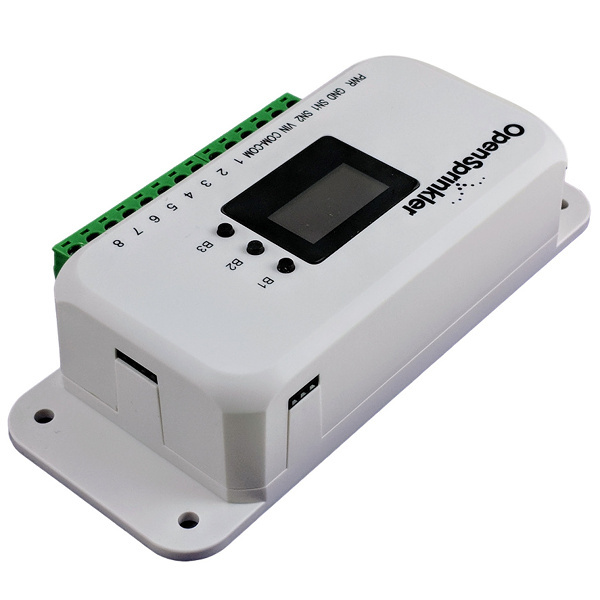 The power options are flexible: you can power it with any DC adapter that outputs voltage between 7.5VDC to 12VDC, or use solar panel (12VDC). 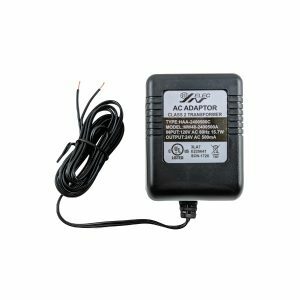 It does NOT work with all 24VAC pump start relays — if you have a 24VAC pump start relay, we recommend the AC-powered version. 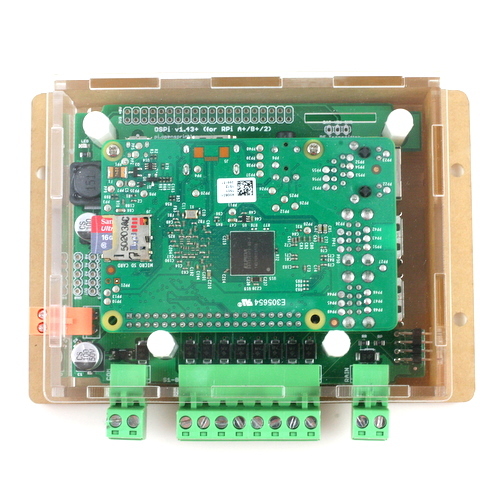 For details about how DC-powered controller works, please refer to this blog post. Latch version uses a 7.5VDC power adapter, included in the package for all orders shipped to US/Canada/Mexico (excluded for other countries). It’s designed to work with latching solenoid valves only. The power options are flexible: you can power it with any DC adapter that outputs voltage between 7.5VDC to 12VDC, or use solar panel (12VDC). Intuitive User Interface — no more messing with buttons and knobs, no more running to your garage to make a single change to your sprinkler programs. Instead, use web browsers and our free mobile apps to access OpenSprinkler from anywhere, whether you are at home, at office, or away traveling. Smart Control — our weather algorithm automatically adjusts your sprinkler run times using real-time weather data. It not only stops watering when it rains, but also adjusts the water time on a continuous scale based on your local weather conditions. 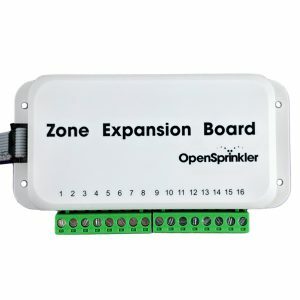 Expandable — 8 zones on the main controller; expandable to 72 zones with OpenSprinkler expansion boards. Have more than 72 zones? Our app can manage multiple OpenSprinkler systems for limitless expansion. 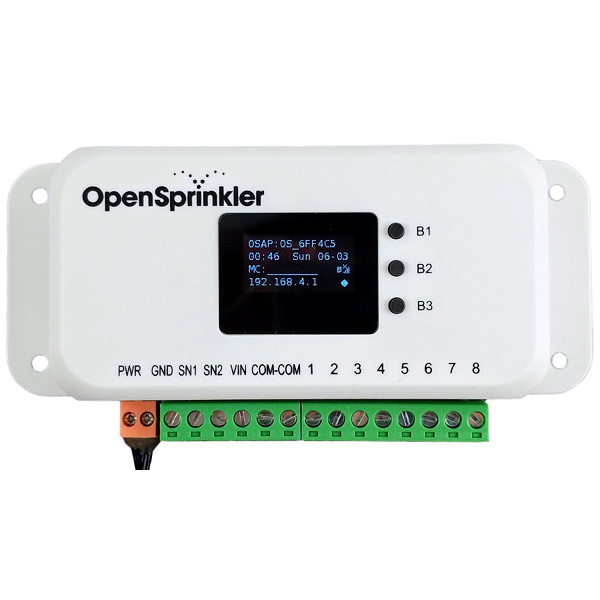 Compatibility — OpenSprinkler is a drop-in replacement of conventional sprinkler controllers. It supports master zone / pump start relay, rain sensor, flow sensor, program start switch, and has buttons and an LCD for manual control on the controller. Advanced Features — OpenSprinkler supports advanced features that you rarely find on other competitor products, such as support for remote stations, radio frequency (RF) stations, flow sensor, dual master stations, repeating program start times, multi-language support. 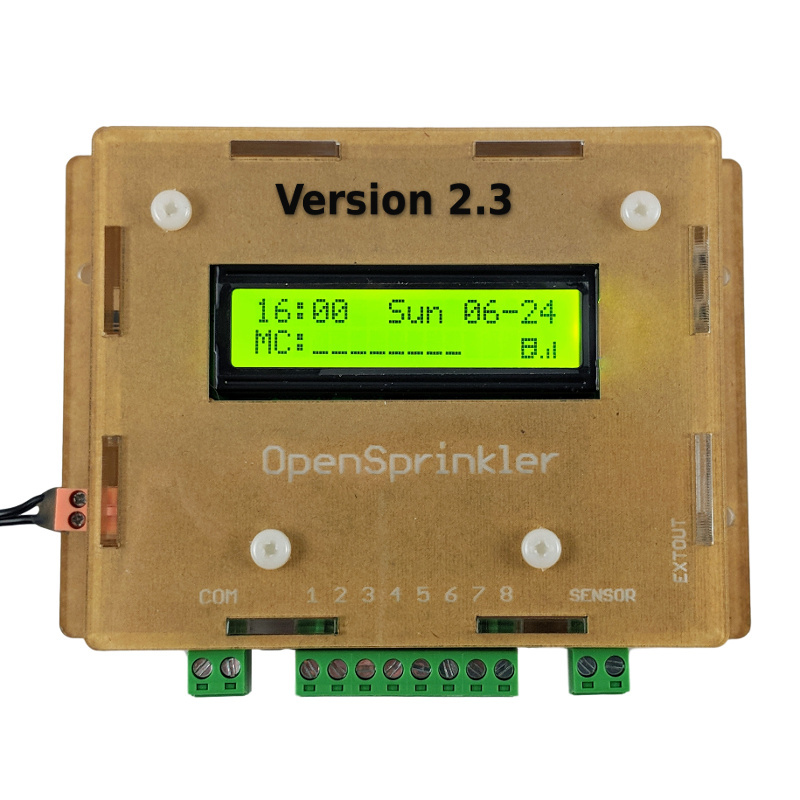 Open-Source — OpenSprinkler is built on open-source software and hardware. Its design files are publicly available on Github. Our mission is to educate and to leverage community wisdom to help make the best sprinkler controller. If you have technical skills, you can extend its capability in any way you need. Check out the OpenSprinkler Support page for tutorial videos, user manual, and API documentation. Volume discount available (starting with 5 units). 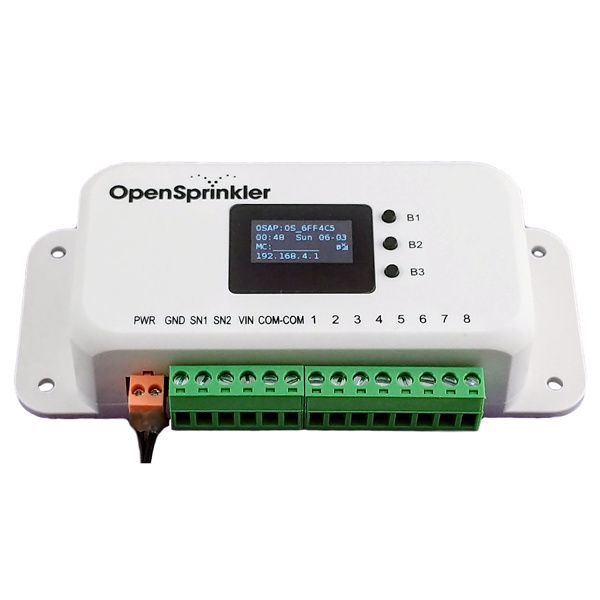 If you must use wired Ethernet connection, choose OpenSprinkler version 2.3, or alternatively, use OpenSprinkler 3.0 with a travel router that supports Access Point (AP) mode, which serves as a seamless interface between wired Ethernet and WiFi). The setup is super easy and the interface on the app is too! You can set timers for one time or programs that go off on any type of schedule you can imagine. Get a free api key to wunderground and it will get live weather data to automatically adjust your programs. If it is a really hot dry day, it will add more time to each zone. If it is really humid or has rained in the last day or two, it will adjust the run time down depending on how much it rained. I LOVE how it doesn’t rely on a cloud/subscription service to run like most other smart sprinkler systems do. It has its own built in webserver. I farm 15 acres in Arizona, all of it on drip irrigation. I’ve worked with many valve controllers (simple battery operated – DIG, high tech Hunter units, custom built – $2000+, and multi-smart controllers)… This valve controller beats all of them hands down and allows me the flexibility to do more. First off, the DC implementation is great. I can run one unit in the shed with AC power using a wall converter and have another in the field running off of a battery charged by solar. Second, I can bounce the signal from the remote field unit to the shed using a directional wifi antenna (bridge also powered by solar & battery) and interact/schedule the valves on both units as if they are one unit. This is huge when trying to coordinate and balance water use on multiple blocks that all are fed from the same source. I used to have to have a timed spreadsheet, manually sync all my battery operated controller clocks, and hope I didn’t screw up my programming. Third, the ability to expand the controls beyond valves is great. I’m working now on integrating my fertigation (for liquid fertilization injection) system with the valve controls to allow for coordinated fertilization and irrigation. Being able to do this from the same controller and activate pumps/valves while irrigating is truly deluxe! Out of the box this unit is fantastic, with a little bit of tinkering and ingenuity it will shine beyond your wildest irrigation dreams 🙂 I’ve had mine in use for two growing seasons now and can’t be happier with it. I LOVE this sprinkler controller. I have been working through automating all sorts of aspects of our large home. All the controllers I’ve been building myself (most based ESP 8266 chip as well). I was planning to build a sprinkler controller for my 24 zone watering system and came across OpenSprinkler in an article about switching AC solenoid valves with DC circuits. A couple of months passed and I hadn’t started building it yet, and then I thought why not just buy it from OS. It was so easy to install – I put it in the enclosure of one of the two controllers I had before, and consolidated all the zones into this controller (with the expander). Now I can set it all up from inside my house. So happy. I was a bit apprehensive about using a ESP8266 based controller but I purchased the new rev 3.0AC unit and an expansion board. I have done Arduino ESP8266 projects in the past and know that this system is fairly good but sometimes can go offline and requires a reboot. I tested the sytem in my office for a few weeks to convince myself that the system would be solid. It passed all my tests so I removed my old Hunter controller and installed the new OS3.0AC system. Well the first time I turned on my system to run through a 1 minute test was eye opening. I caould see the valve current live on the display as well as remaining time and such. I can’t believe I waited to change my old controller. The install is really straightforward and easy. The reliability has been rock solid so far. The only downside is I didn’t care for the acrylic laser cut case. Yes it’s a case but it just gives the unit a bit of a cheap look and feel. I would have preferred a better case. It really dones’t matter as I installed the units inside an an old Hunter controller box in the garage. You can only see the laser cut acrylic cases when the door is open. Very well made and a pleasure to use. I really like the ability to label the output/solenoids, this makes activating the right one super easy. Equally nice is the ability to test the lines with mobile app while inspecting/fixing sprinklers. Being able to see current used by a solenoid has helped me diagnose some faulty solenoids which I would have wrongly thought was a sprinkler issue. I am so impressed with the one in the backyard I have just ordered another one to do the front yard along with the RFToy. I purchased an OpenSprinkler 3.0 for my cabin where both the wifi and remote control aspects solved problems for me. I have had system failures there with other controllers and not know for weeks since I don’t live there. Like brucewf above I love the ability to check the current draw. I am so enthusiastic about this system that I ordered a second one for my home and removed my Hunter controller. This system is light years ahead. The smart weather adjustments alone will pay for the unit. It is SOOOOO much more accurate than a simple rain gauge at zero cost. I replaced my Toro TMC-212 with your fantastic opensprinkler. The installation was really easy, it worked right from the start – thanks to your YouTube-Videos. To control my sprinkler from the smartphone/tablet is so much easier. The usability of your App is just perfect. I always had a rain sensor installed, but I never knew if the sensor is on or off. Now I can see it immediatelly in the app. Best greetings from Austria / Europe – your product is just the best!! !